Yesterday was a bit of an usual day for me as I got to tag along to a photoshoot for work! ^ As you can see we hired the Patriots equipment manager to deflate the stability ball to make the photoshoot extra hard for our client! She was a champ though! 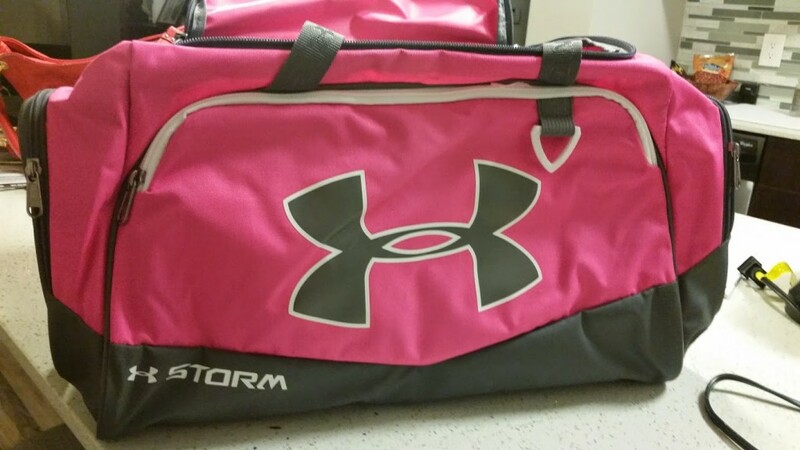 In addition to the photoshoot I also did a bit of shopping yesterday and picked up a cute new gym bag by Under Armour (among other things)! I tweeted about needing a new gym bag the other day and finally found The One. I love the pink and grey combo! In the vlog I show this baby off, but I totally forgot to say WHY I suddenly need a gym bag! You may have noticed that I haven’t been running at the beach much lately when I used to do it every single day. My new apartment is only about a mile further from the beach than the old apartment BUT that one mile winds through a fairly dark neighborhood (since I run at night). It’s a really safe neighborhood but running through the streets still makes me a bit nervous, so I’ve decided I’m going to bring a gym bag full of my running clothes with me to work. I’ll change at the end of the day and then drive over to the beach to get my run in. It kinda sticks having to DRIVE to the place you want to go running, but it’ll be worth it because I miss the sand and the waves! I’m still able to run to the beach from our place on the weekends when I can run in the sun. And I’ll be able to do it on weeknights after the time change finally comes around! Alright, I’m off to wrap up this work week and then prep for the Superbowl! Have a great day! – Let’s do this thing, Brady! Make the AFC East proud! Next Post Stronger + Faster! Your pictures make me miss the beach so much. Summer where are you???? That sounds like a fun opportunity! It will be here before you know it! Can you believe it’s almost February?! That’s such a fun way to spend a work day! So cool that you get to call all the shots, I would of been a total diva ordering everyone around lol. I dislike both teams but I dislike Pete Carroll more, so I’m rooting for the Patriots. That’s so fun that you get to work at fitness photoshoots! I like that new little gym bag! I have 2 little gym bags that I’ve gotten from different races, and they’re so nice to have! That’s really cool that races have given you gym bags! That’s like the ultimate swag! This was my first time getting to go on a photoshoot! I hope our art director takes me again! That would be so cool to be on a fitness shoot like that! I am in general a positive, happy lover of almost all things. There are only about two things in this world I actually hate: 1.) People and industries that abuse animals and 2.) New England Patriots. They are about on par with each other, in my book. 😉 But, Super Bowl should be fun regardless! Hahaha wow! That is some serious dislike of the Pats! I HOPE it’s a really good, close game. Last year’s blowout was a bit of a disappointment. I was rooting for the Seahawks last year but close games are so much more fun to watch! That photo shoot sounds fun, and really interesting! I would make sure that I was able to run at the beach if I were you too! At least in the summer the darkness won’t be a problem! Yes! It’ll be wayyyyyyyy too hot out during the summer, but at least I’ll get to run to the beach, haha. I suppose I’ll take that trade off! Hmmm this is a tough one. I’m still reeling from our heartbreaking loss to the Seahawks, but if we’re going to lose to anyone, I’d rather it be the eventual Superbowl champs. Plus, I’ve always kinda liked the Seahawks. I rooted for them in last year’s Superbowl and I like Russel Wilson. But, on the other hand, I don’t like to see repeat champions – it’s more fun when someone new wins it each year. Plus, it would be kind of neat to see Brady get one more ring, 10 years since his last one. So I don’t know, it’s hard to pick an allegiance! I’ll enjoy being able to watch it without any vested interest either way. Makes it much more relaxing, that’s for sure! I’m with you! I picked a team because I think it’s more fun to have someone to root for, but in the end I’ll just be happy with a good game since the Dolphins aren’t in it. Definitely much less stressful! I can only imagine how horrible it was to watch the last five minutes of the Packer’s game two weeks ago! LOL! “I can tell you’re pulling a Marshawn Lynch.” Bahahah. Glad Cecil got some more camera time 😉 Bring on the Kristina & Cecil vlogs! Like I’ve mentioned before, I’m not much for NFL but I do root for the Seattle Seahawks in a loose sense. I used to watch Russell Wilson play at the NCAA level and he first started out at NC State (which is where my future father-in-law went and several of my friends too!). Smart idea on changing into running clothes at work and heading straight to the beach. 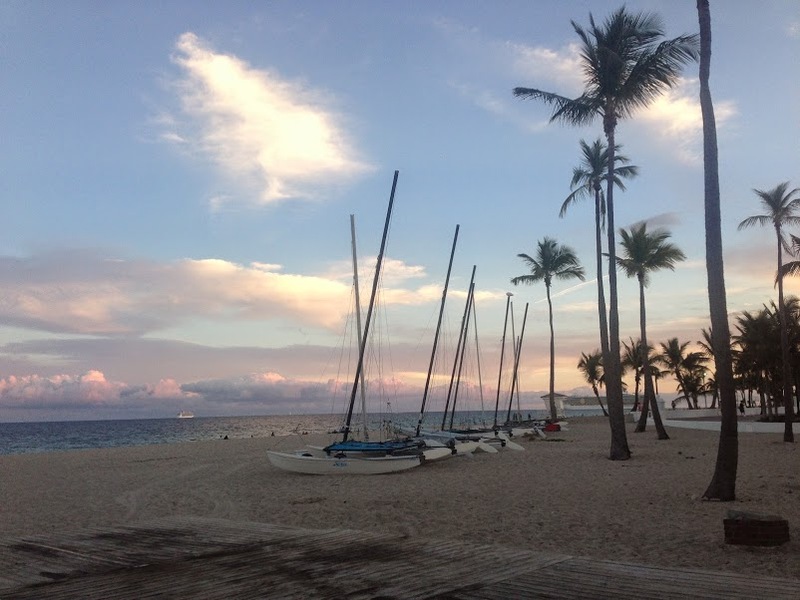 I ran along the public beach in Fort Lauderdale when I visited in the past and it’s so nice! But you wouldn’t find me wandering any of the other streets much on my own, at least not without knowing where I was going. I am incredibly biased but I think it is the best beach in the whole world and the perfect place to run! I was a little bummed out that the Miami Half didn’t really take us along the beach front, but the views were still realllllly nice crossing the bridges to and from the Miami Beach area! I think you’ll really like the course next year! i’m so envious that you still can run on the beach! i miss my lakefront runs. Loving the football references throughout this post. ☺ Although, Brady is going to have his hands full dealing with the LOB!!! I just hope it’s a good game. Go Seahawks!!! I think it’s great that you are driving to the beach after work for a run. I could easily run from my house every day, but I often drive to different places to switch it up. Nothing wrong with that!! Plus, then you can get home and settle in. I love your vlogs. 🙂 I watched it while I ate dinner. I eat fast, so it was the perfect length. Christmas just wants out of the house. Period. When he gets out, he either runs right to the grass and starts eating it, or he runs into the driveway and rolls around. I love it. I remember when I lived in my apartment. If he would get out the door, he’d dart down all four flights of stairs and into the laundry room. He is afraid of NOTHING. That’s my boy!!! Hahaha wow! When Cecil gets out the door he runs halfway down the hall, waits for me to catch up and then runs back to the apartment door and flops down for a belly rub! I can’t believe Christmas went down the stairs!!!! Cute Vlog!!! Sounds like a fun photo shoot- love that you get to do fun stuff like that. It was nice to shake up my normal routine with the photoshoot! I hope I get to do another one! The beach is my favorite place to run. I used to run there six days a week… I really need to get back to that! I am super excited for Miami too! Why is it a full year away?! Hopefully we can meet up in Chicago!!!! Glad you found a way to avoid the scary dark place hihi. Thank you! I love the combo of pink and grey! ME TOO! I am sooooo ready for that time change! Your job is like…the coolest :o) Seriously, it looks like fun! Most days it’s much more boring and includes a lot of spreadsheets, but the photoshoot was a lot of fun! !